Please contact with reservation manager Helena Piątek. You like when lots of things go on, when you’re around your friends and…strangers who can became your aquintances? Don’t you like phoney atmosphere of rigid hotels? – prefer ‘dog days’, natural atmosphere, freedom, and ability to use the kitchen when you are hungry? You hit the mark! We understand you perfectly and here we are: Cinnamon – Hostel where you are always more than welcome. Cinnamon hostel has very comfortable beds and warm staff – we’re always here to help you. If you had liked our hostel, we would be glad to welcome you in Cinnamon Hostel in Poznań and Intro Hostel in Kraków, and you’ll get a discount!. We can’t guarantee bosom of nature silence and peace, anyway, we provide you eventful stay in the city center! We’ve been trying to improve the quality of our services. Our staff is going to do everything to brighten your stay. We’ve got experienced crew – each of us travels a lot. We have been organizing interesting events in Cinnamon Hostel, keep it tidy, help you to plan your time and keep you company. The only thing which you need to do is ask us, We’ll certainly help you. Each of our room has different colour, Is it romantic Honey which will became your favourite, or comfortable Chilli with intimate restroom? Shared restrooms are for males and females. We have rooms for 2, 3 or 4 people and in our dorms there are 12,8,6 and 5 places! In our hostel you can use free WiFi, buy soft drinks and basic toiletries, or rent a towel. You can also pay for laundering, but your bedding you’ll always get for free. Our kitchen is fully-equipped, so if you like, you can prepare a meal, or visit one of recommended restaurants: Kurna Chata (1000m) Lot Kury (350m), Bazylia – marche (900m), Frankie,s (500m), for vegs Złe Mięso (350m) and many other. 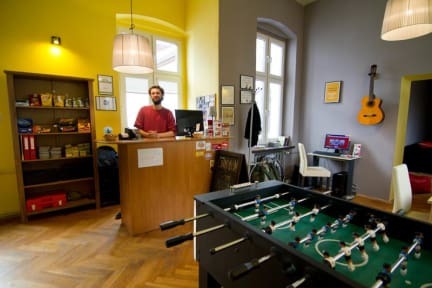 Cinnamon hostel is situated in the city centre, on Kazimierza Wielkiego 67 which goes around market square. You can walk to market square (350m), Galeria Dominikańska(mall/shopping centere, 500m), train or bus station(1400m). Important monuments or amusements are also close to us. Panorama Racławicka (1km), Śląsk Wrocław station(4,5km), National Museum(1km), ZOO(3km), Słodowa island(1km), Centennttial hall and Wroclaw’s fontain(3km). Most of Wroclaw’s univercities also are around. Great hostel! The only disadvantage is wi-fi doesn’t work correctly in rooms. Very nice travellers hostel. Good locaited. Felt good from very beggining. Just 2 things was missing: internet did not work in the room and the only place in was working - reception and the kitchen is too small for amount of people staying there ( it was always occupied with groups of guests). Other than that I'd recommend. To rent a bicycle is very cheap in this hostel.